Few things are as satisfying as creating the perfect yarn for a special project. 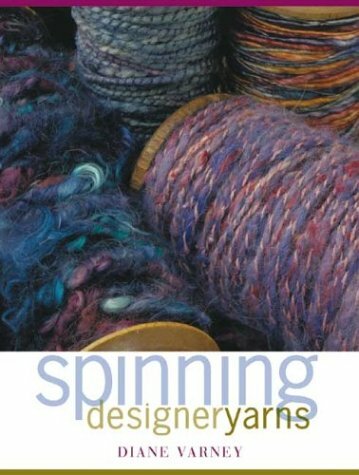 Spinning Designer Yarns leads spinners into the world of super-soft luxury fibers, textured effects, and the dyepot's miracles. Learn to apply dye to fibers in new and exciting ways, predict how novelty yarns will look in finished fabrics, blend fibers for color and texture effects, and spin singles and plied yarns in ways that will put more zip in your spinning - and your weaving, knitting and crocheting. Corespun, bouclé, snarl, knotted, and tufted yarns will become part of your spinning repertoire, and you'll rediscover the excitment of spinning all over again. 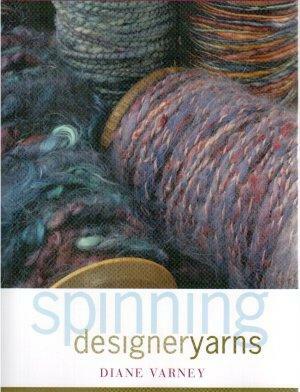 Diane Varney is an author and artist of many talents including spinning, painting, and jewelry- and pottery-making. Her current artistic focus is on making colorful dinnerware. She devides her time between homes in Baja California, Mexico, and the San Francisco area. Wurde der virtuellen Wanderbücherei des Handspinn-Forums übergeben. Ist gerade im Briefkasten gelandet. Das Buch bietet viele Anregungen und Tipps. Die verschiedenen Verzwirntechniken machen Lust zum experimentieren, lassen aber der eigene Kreativität viel Spielraum. Wer einmal sein eigenes Effektgarn gestalten möchte findet hier eine geeigente Anleitung. Leider gibt es das Buch nur in englisch. Auf den ersten Blick schon ein sehr gutes Buch. Werde es in den nächsten Tagen noch vertiefen - aber die Bilder sprechen bereits schon für sich. Ich freue mich schon auf das Ausprobieren.